Aerobic treadmill is a simple way to increase your heart rate as you increase the pace a little as each minute passes, going from a slow walking to a fast walking or even jogging. Exercise must be strenuous enough to raise your heart rate into your target zone, usually between 70 and 80 percent of maximum. Aerobic exercise means how well you are able to take oxygen from the atmosphere into the lungs and then into the blood and pump it through the heart and circulatory system to working muscles, where it is used to oxidize carbohydrate and fat to produce energy. When you engage in an exercise such as walking or jogging using a treadmill at a level above your normal daily activities, you over load the muscles and their support systems, including the heart and lugs. If you repeat the aerobic treadmill exercise regularly e.g. every day or every other day your body begins to adapt to the overload imposed by the exercise. This is called many adaptations the training effect, the exercise somehow signals muscle fibers and support systems to undergo changes that will permit more exercise in the future. 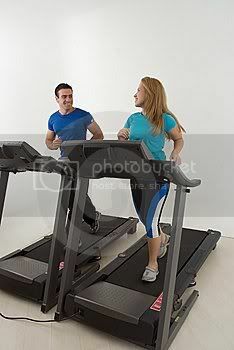 How to get best out of your treadmill exercise and what is the best speed and pace for you refer to treadmill trainer. Aerobic exercise if preformed often enough, you will improve your aerobic fitness and as fitness improves you will further enhance your health, appearance, vitality, and quality of life. Other benefits include, mental alertness, eg ability to handle stress, a better attitude and emotional lift. Aerobic exercise helps keep our brain chemicals in balance. One group of chemicals that are produced in abundance through aerobic exercise, are endorphins. These brain chemicals tend to relax us and give us an ability to cope with stressful situations in afar more relaxed manner. Studies consistently show health benefits of exercise for being aerobically fit. These health benefits extend to every area of life, from strengthening your heart to reducing your cholesterol levels to increasing your flexibility, all of which adds up to feeling, working and playing better. In 1996 surgeon general of the United States released a report that linked aerobic exercise with the prevention of several serious chronic diseases such as heart disease, stroke, diabetes and cancer. Many scientific studies confirm the self-evident, that running on a treadmill works as well as, and often more efficiently, than other forms of aerobic exercise. University and research groups have repeatedly conducted tests using a variety of stationary aerobic equipment, to compare the efficacy of treadmills, cross-country ski machines, exercise bikes, and aerobic riders in burning calories. Reports by the Journal of the American Medical Association, the American college of sports medicine, the University of New Mexico, the medical college of Wisconsin, and a number of other institutes and groups, come to the same conclusion. Regardless of an individual's gender, height, weight or fitness level, treadmills burn more calories per hour than other devices. These studies demonstrate the supremacy of the treadmillfor exercise. Warm up before first, start out doing the same exercise you are going to use for the workout at an easy pace for a few minutes. Then start a regular intensity workout, for example if wanted to run, start with easy jogging or even walking; depending on your fitness level. Run or walk with your back comfortably straight, your head up, and your shoulders relaxed. When jogging, bend your arms hold your hands in a comfortable position, and keep arm swing to a minimum. Pumping action will increase with more speed. Swing your legs freely from the hip with no attempt to over-stride. 5. For new runners it is recommended the heel to toe foot strike, because this technique is the least tiring. Land lightly on the heel and roll forward to push of the ball of the foot. After intense aerobic exercise it is important to take 10 minutes or so to cool down. Do not stop straight away, for example after a long run or jog on a treadmill reduce the speed for walking pace, keep walking for a few minutes and gradually stop. 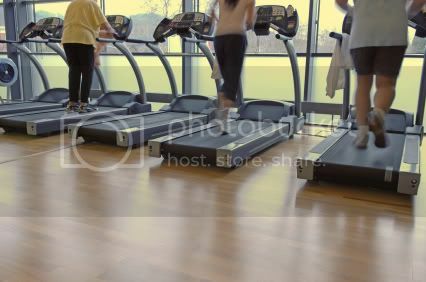 Aerobic treadmill exercise is great way to loose weight and get in shape, one of the fastest ways to loose weight is by Aerobic exercise and a treadmill is one of the best pieces of exercise equipment for this type of exercise. It will help your blood flow, reduce the risk of cardiovascular disease and most importantly it will help you get in shape. Treadmill Exercise And Diabetes How Does it Help To Manage Diabetes?